"Clean eating" is associated with the healthy lifestyle and body beautiful that is promoted by many online bloggers. While the term is heavily used in social media, there has never been any agreement on what it really means or any comprehensive studies examining the potential benefits of a clean eating lifestyle as a whole. However, the core principles that the big names in this movement champion appear to be: eliminate processed food; reduce salt intake; eat more vegetables; choose whole grains; eliminate refined sugar; reduce alcohol. For some, you also need to be gluten, dairy, and soya free and to eat raw (depending on how militant you are, food has to be entirely uncooked or only mildly heated). And if you want to be completely "clean" you should probably be vegan, too. Quite a list, then. And there are also some big players online - including Food Babe, who was voted by Time Magazine as one of the 30 most influential people on the internet - who have significantly influenced this trend. While some of the principles of clean eating are in line with the best available evidence for losing weight or preventing ill health - such as eating plenty of fruit and vegetables, sticking to wholegrains and limiting processed food - there are plenty of others that don't stand up to scrutiny. It has been repeatedly proven that dietary restrictions such as a dairy-free diet or gluten-free diet are nutritionally substandard and studies have linked the introduction of a gluten-free diet with increased levels of psychological distress in coeliacs including depression and anxiety. Some people find it difficult to understand why dietitians and doctors are against the clean eating phenomenon when there are still people eating burgers for breakfast and obesity is on the rise. 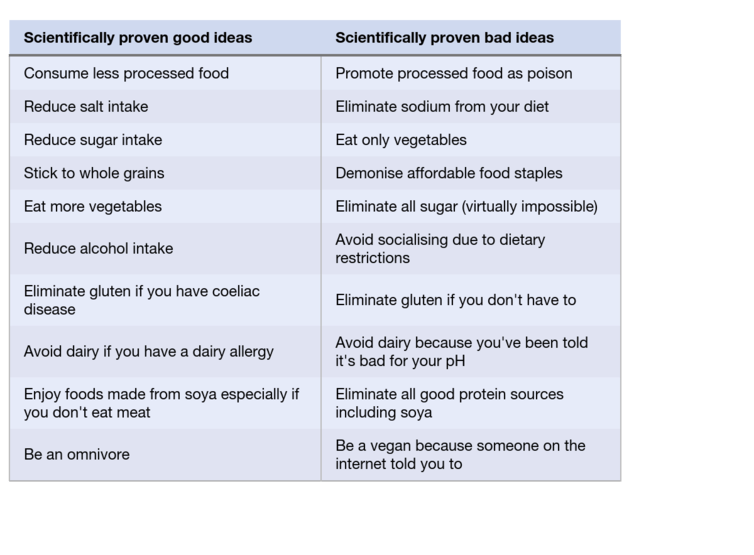 However, some clean eating is sensationalist promotion of non-evidence based, and extremely restrictive, lifestyles that demonise everyday food essentials. And that can lead followers into having a sense of shame and failure for not eliminating "unclean" foods 100% of the time - so you can see where the negativity from healthcare professionals stems from. There is significant research disproving many of the principles of the diet. Below are some of the big claims and why they don't stack up.